Deflecto Flat Back Literature Holder A4 DE76401 Pack of 1 Deflect-O Flatback Literature Holder. Clear literature holders for maximum visibility. Features include a shallow profile with a flat back design suitable for use on any vertical flat surface. Size - A4. 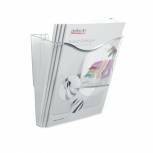 Deflecto Crystal Landscape Literature Holder A4 CPO74YTCRY Pack of 1 Wide polystyrene literature file with larger than average capacity, ensuring frequently used files are kept close at hand. Can be wall mounted (screws and plugs supplied) or hung over screens and partitions. Colour - Crystal. (Shown in graphite). 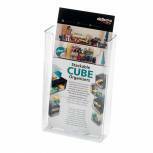 Deflecto DL Literature Holder A4 77001 Pack of 1 Crystal clear free-standing literature holders keep your leaflets on display neatly. Can be wall mounted. A4. Q-Connect Slanted Sign Holder L-Shape A4 KF04177 Pack of 1 Ideal for display on retail counters, reception desks and information points. Display notices, certificates and various other information. Sturdy plastic. Slanted for optimal display. L shape. Side loading. Format: A4. Announce Slanted Sign Holder A4 DF47401 Pack of 1 Slanted version of the stand-up sign holder. 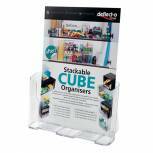 Stands back 10 degrees, ideal for point of sale notices. Single sided, loads from side. A4. 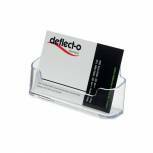 Deflecto Business Card Holder 70101 Pack of 1 This useful clear business card holder ensures your name is constantly on display. Ideal for reception areas and exhibition use. Fits snugly onto front of rigid literature holders (items A and B) for added information. Maximum card width 95mm. 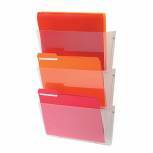 Announce Literature Holder A5 DF10086 Pack of 1 Literature holder. Clear plastic allows contents to be displayed easily. Slanted for optimum presentation. Accepts leaflets up to A5 (210x165x73mm). 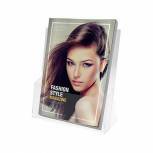 Deflecto Crystal Portrait Literature Holder A4 CP078YTCRY Pack of 1 Deflecto Portrait Literature File 210. 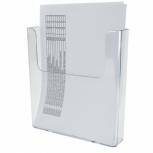 Crystal Clear wall-mounted literature holder, suitable for storing A4 documents upright. Complete with screws, plugs and fixings. (Landscape in graphite shown). Deflecto Linking Wall File Pocket A4 Clear 73201 Pack of 1 Standard Wall Pocket to take A4 papers. Supplied individually boxed complete with screws and self-adhesive fixings. The files will link together for maximum use of wall space. Clear. 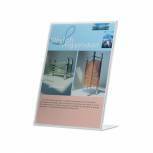 Announce Slanted Sign Holder A5 DF47501 Pack of 1 Slanted version of the stand-up sign holder. Stands back 10 degrees, ideal for point of sale notices. Single sided, loads from side. A5. Deflecto Landscape Wall Sign Holder A4 DE469YTCRY Pack of 1 Ideal for internal notices and signs - near the copier, reception, canteen in fact anywhere a sign needs displaying. Drilled for wall mounting, loads from top. A4 landscape. Deflecto Portrait Wall Sign Holder A4 DE470YTCRY Pack of 1 Ideal for internal notices and signs - near the copier, reception, canteen in fact anywhere a sign needs displaying. Drilled for wall mounting, loads from top. A4 portrait. 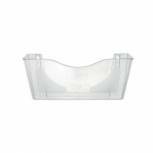 Deflecto Linked Wall File Pocket A4 (Pack of 3) DE736YTCRY Pack of 1 Deflecto Linking Wall File Pocket A4 Clear Pk 3 DE736YTCRY Link together for maximum use of wall space. The optional brackets enable pockets to be hung from office screens/partitions. Screws and self-adhesive fixings included. 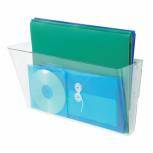 Deflecto DL Clear Flat Back Literature Holder DE76001 Pack of 1 Deflect-O Flatback Literature Holder. 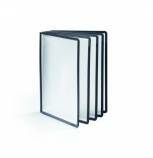 Clear literature holders for maximum visibility. Features include a shallow profile with a flat back design that can be either wall mounted or used free standing. Size - DL (1/3 A4). 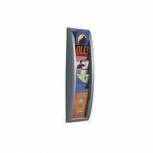 Deflecto Landscape Wall Sign Holder A3 DE48000 Pack of 1 Deflect-O A3 Landscape Wall Sign Holders. Clear holder ideal for internal notices and signs near the copier, reception, canteen in fact anywhere a sign needs displaying. Drilled for wall mounting, loads from top. 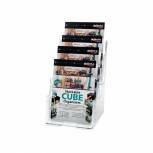 Deflecto 4 Tier Literature Holder A5 DE779YTCRY Pack of 1 4-tiered literature holder. Size: A5 (148x210mm). Durable and clear styrene construction. Can be wall mounted or free standing. Slanted for optimum presentation..
Fast Paper Quick Fit System Wall Display 5 x 1/3 A4 Silver 4062.35 Pack of 1 Paperflow 4062.35 wall display system. Wall mounted display unit with five transparent compartments to accept leaflets and brochures up to 1/3 A4 in size. Dimensions: 175 x 90 x 647mm. Wall fixings not supplied. 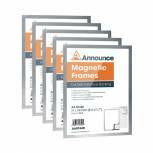 Announce Magnetic Frame A4 Silver (Pack of 5) AA01841 Pack of 1 Self Adhesive pockets stick on any porous and clean surface. Protect, store and display. 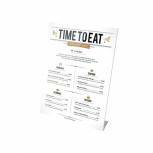 Ideal for use with in-company communication, shops, hotels, restaurants and factories. Update information quickly with the magnetic strip closure. 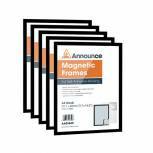 Durable Sherpa Display Panel A4 Black (Pack of 10) 5606-01 Pack of 10 Pack of 10 coloured frame display panels. Made from anti-glare PP foil, copy proof and ideal for holding catalogues, price lists, machine operating instructions, presentation materials. Colour - Black.